The 2015 Study Abroad group in front of the Eiffel Tower. 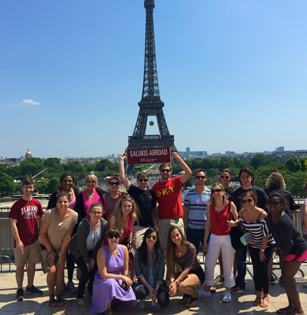 “It’s the best money I spent.” That statement made by Bruce Mehr, a participant in the 2015 Study Abroad trip, speaks volumes about the success of the annual SIU College of Business Study Abroad Program to France. It’s a once-in-a-lifetime experience that fosters personal growth and academic enrichment – and one that opens doors to new career avenues and opportunities, too. Entering its 14th year of existence, one of the largest study abroad programs at Southern Illinois University Carbondale is now accepting applications for the 2016 trip to the Alpine city of Grenoble in southeastern France. From May 16 through June 11, participants will attend classes at Grenoble Graduate School of Business’ main campus for the first three weeks before concluding their coursework at the Grenoble School of Management in Paris during the last five days. Outside of the classroom, the students are encouraged to venture in and around Grenoble while making use of the convenience of its central location and the accessibility of public transportation. With the weekends free, the students can further travel to nearby countries such as Spain and Italy. The deadline for the program, which is open to all majors across campus, is March 1. The prerequisites are a minimum GPA of 2.7, and attendance in four two-hour mandatory meetings before departure. Fluency in French is not required but is a plus; all classes in the summer program are taught in English. The program’s total cost of $$5,500 includes tuition, lodging. Travel scholarships are available for a limited number of students. Last year, 12 out of 15 participants received financial support for the trip. The program is a great personal experience and a great résumé builder, and it also offers a minor in marketing upon the completion of the program in both Grenoble and Carbondale. According to program coordinator Darla Karnes, the students must complete six credit hours and two classes in France, in addition to one field study that serves as an opportunity for the students to share their experiences along the way. Along with the completion of MKTG 304 and 305 courses before and after the trip, the students earn 15 credit hours in the process. Given such a unique opportunity, 40 percent to 50 percent of the students who go on a study abroad trip with Karnes are non-business majors. “Some of them are majoring in public relations, fashion merchandising, automotive engineering, advertising, mass communications and journalism,” she said. As a former first-generation student – and as a member of the accounting faculty for 16 years – Karnes regards the diversity of the group as one of the strengths of the annual program, which is entering its 14th year of existence. “It gives the students a chance to interact with students they would have not met on campus, and have classes together,” she said. Morris’ advice for prospective students is to have a positive attitude and be ready to ask questions. And yet, she said, it’s the accompanied personal growth that she considers as one of the biggest takeaways from her trip to France in 2015, in addition to the insightful coursework in which she learned about different marketing strategies within Europe. “The freedom to do whatever we would like when it comes to activities after class – and where we would like to eat and travel – made it so much better to be able to create certain bonds with your peers, as well as exploring the country and figuring things out on your own,” Morris said. Karnes said she regards her first Europe trip at the age of 28 as a life-changer, further highlighting the fact that taking full advantage of this opportunity also requires limiting technology use to a minimum. With the departure date on May 16 quickly approaching, Karnes said she already is excited about the next upcoming trip, and encourages everyone who is interested to either submit an application as soon as possible or to contact her by email at dkarnes@business.siu.edu to schedule an appointment.